Macy’s have their latest deals in their one shop spot. They have launched their new promotions on their website and allow online shoppers to save deals directly to their wallet. Deal hunters can now easily save and checkout fast through their phones or portable tablets. From payment information to savings passes, they keep everything you need to shop in one easy-to-manage location. They have the latest version of their app. You can easily receive their special offers, savings, as well as access to your registry and gifts for others. With this new app, you can easily shop their entire online assortment, anytime and anywhere. This One Day Sale events generally take place prior to major holidays. These are the times where you can grab huge discounts for your household items, jewelry, shoes, bed and bath, handbags and clothing. Just keep an eye out for TV or online advertisements to avail of this popular One Day Sale. For online shoppers, most of the time, internet prices are better than in-store prices with the help of ecoupons, coupon codes and cashback stores. In addition to savings, it’s actually more convenient to shop online that is why many online shoppers take advantage of the $99 free shipping and free returns. Please take note that their Free Returns exclude food, gourmet gifts, gift cards, furniture, lamps, wall art, mirrors, mattresses and area rugs. Their Free Returns do not apply to international orders. You can simply return the merchandise that you purchased for a full refund, which will be credited on your original tender. Those gift returns or orders with a different shipping and billing information or the ones paid with a Gift Card shall be refunded via an Easy Exchange Card, which you can also use for your future online or in-store purchases. Shoppers like their popular mark down in-season sales that usually takes place a month prior to the season ending. They enjoy these famous clearance sections that happens generally in the middle of any season to grab their low priced items. Look for their online coupon codes and printable coupons weekly. They generally offer 10-30% off your purchase. These coupons are usually specific to departments, like 30% off all Men’s Apparel, 25% off Clearance Items, however, site wide coupons can also be available from time to time. We have the list of their latest online coupons on top of this webpage powered by Savings.com. You can also find a listing of coupons at their own website at Macy's.com in their "Deals & Promotions" section. The social media like Facebook and Twitter are useful online tools for getting Macy's sales, bargains and new coupons too. 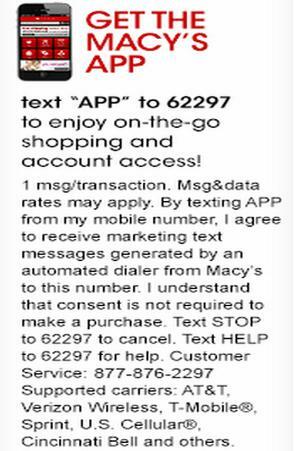 You can get online coupon codes as well as printable coupons for Macy's by signing up for their Macy's email newsletter. When you sign up for their free email newsletter, you’ll be surprised to their various deals and coupons sent right to your inbox. This is another way to stay up-to-date with their deals, promos and special events. They will send you online and in-store exclusive sales as well as event information directly to your email’s inbox on a weekly basis. Major retailers nowadays offer incentives for signing up in their newsletter. With Macy’s, they generally offer a 15% incentive when you sign up for their emails. Once you’re done signing, you have to wait for your new discount to arrive. You can also receive additional savings like popular cash back websites like Fatwallet’s Cashback, Ebates, and among others prior purchasing anything from Macy’s. Fatwallet also has a list of updated coupons that you can use when you're checking items out and save money through their cash back reward. Sign up for a Macy’s store credit card to avail of their Star Rewards program. If you shop often at Macy’s, this can add savings to your wallet as long as you know when the right time to pay. This Star Rewards program offers a good amount of discounts from $10-$25 discount certificates all year long. Create a Macy’s wedding/gift registry. In this way, you’ll be able to enjoy their Star Rewards program too. You have to sign up for a Macy’s store credit card in order to receive up to 5% rewards when your friends and family purchase gifts for your special day. There are some exclusions that may apply on certain products. Your friends and family can easily check for a Macy’s gift registry online and they can choose those nice gifts to be purchased under their budget. They can simply place these items in the online cart and see the total amount to pay. Macy’s will send you their rewards card for the total amount that you had earned possibly about 3-4 weeks after your wedding. Receiving cash back on those gifted items is extra savings for your wallet. A Macy’s store credit card can help you save more cash in addition of the sales and coupons. They usually offer up to 15% off your purchases on the day you had an order and the following day. You can make returns up to 180 days later without a receipt. Always remember to pay your balance the soonest possible time to avoid the APR that is up to 24.5%. Paying interest fees is just wasting your hard-earned money. They offer many benefits for their cardholders like extra discounts on sale and clearance items during special sales events up to 25% off. 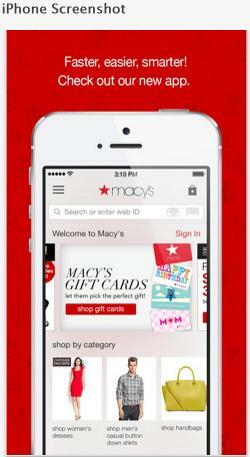 Opening a Macy's card account can easily be done online or in-store. You can also store and manage your Macy’s offers and payment options all in one place with their My Wallet and Star Passes that will be added automatically once you add your credit card to your Macys.com profile. You can easily update your personal information as well as pay your Macy’s credit card bill directly from your tablet or smartphone. If there’s a lower price on an identical product or item at any other local store within 14 days, they will match that price (unless it is a Club or Membership Store where a shopper pay dues in order to shop). While this price match policy applies to almost all products that they sell, they will not match prices on closeouts, fees, special order merchandise or on-line retailers. If their stores further reduce a product or an item within 14 days of your purchase, they will refund the price difference when you present the original receipt. Please take note that we are an affiliate of Macy's through Flexoffer, Google and Savings.com where Macy's is a part of, as a Merchant so therefore try to do your own research when you want to purchase any of their products or services when you are being directed to their official website coming from this web page.